Markdown allows you to write using a simple plain text format, which is converted to valid HTML for viewing on Qualified. You can create a heading by adding one or more # symbols and a space before your heading text. The number of # you use will determine the size of the heading, from one (largest) to six (smallest). > Everyday life is like programming, I guess. > If you love something you can put beauty into it. You can strike through a section of text by surrounding it with double ~. This response ~~is no longer relevant~~. You can make an unordered list by typing either a * or a - then a space before each item. You can make an ordered list by typing a number followed by a . then a space before each item. Note: The actual numbers are not critical, numbered lists will always start at 1 and count up sequentially from there. You can create nested lists by indenting each sublist by two, three, or four spaces. Use single backticks (` ) to format text in a special monospace format. Everything within the backticks appear as-is, with no other special formatting. On line 3, `LaunchRocketship()` should be `**launch**Rocketship()`. You can use triple backticks (``` ) to format text as its own distinct block. Qualified has further extended the concept of Multi-language blocks to allow you to enclose entire sections of markdown within if and if-not statements, similar to how Multi-language blocks work. These statements can target multiple languages at a time if you wish. Using this feature, you can selectively hide or show content based off of the active language, allowing you to manage your instructions for all languages and still target them directly as needed. 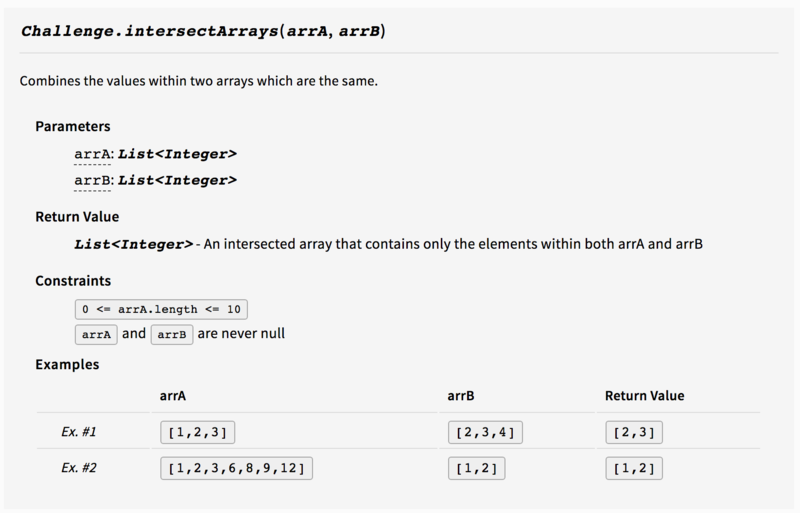 You can also include nested code blocks by using the alternative code fence syntax (~~~). Tip: You can use either ~~~ or ``` as your top level fence for defining a block. We recommend always using ``` for your top level blocks, so that its easier to identify nested blocks. An additional extension that Qualified has added is the ability to wrap your markdown within alert blocks, which allow you to call out certain sections. The syntax is similar to using code fences, but you add a % prefix before the alert type. Our documentation blocks are like alert boxes, but are designed to present documentation. Each block has a special format for handling the contents within it. Our most basic block, it uses a simple format to provide a definition list. <dt> elements are rendered whenever you end a line with a colon (:). All other items are rendered as a <dd> element. Our most powerful documentation block. You use JSON to define a method, its arguments, what it returns, constraints and any examples. Our markdown processor will render this JSON as a well formatted documentation section. It will also use our custom doc types formatting to render the documentation as it should for the specific language being taken in the challenge. 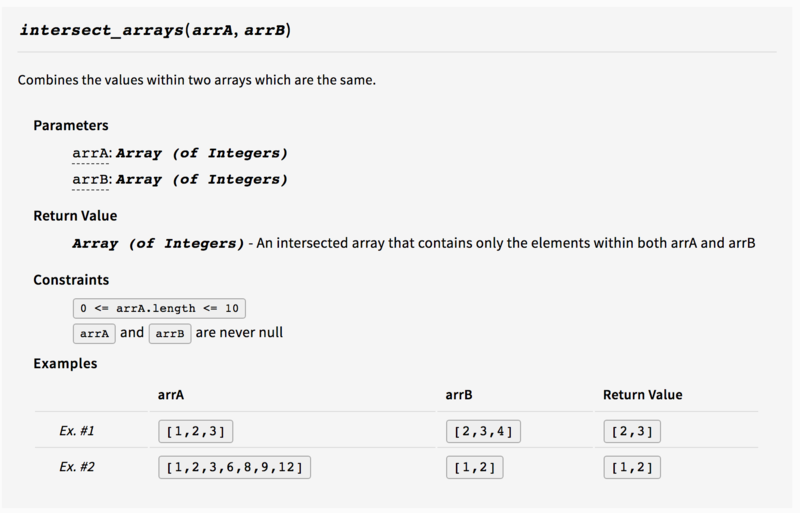 "`arrA` and `arrB` are never null"
"desc": "An intersected array that contains only the elements within both arrA and arrB"
You can create an inline link by wrapping link text in brackets ([ ]), and then wrapping the link in parentheses (( )). For example, to create a hyperlink to http://www.qualified.io, with a link text that says, Visit Qualified!, you'd write this in Markdown: [Visit Qualified!](http://www.qualified.io). Qualified's Markdown editors support drag-and-drop images. Simply drag a file in from your file system, or copy and paste a file into the editor, to have the image uploaded and inserted automatically. You an also click on the link below the editor to open a file dialog to select your images that way. Almost any image file format is supported, and will be converted automatically if necessary. The Image Description portion will be used as the tooltip or alternative text if the image is missing or for screen readers.